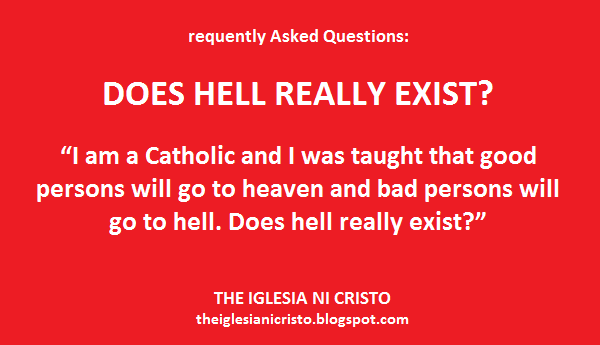 THE IGLESIA NI CRISTO: Does Hell Exist? 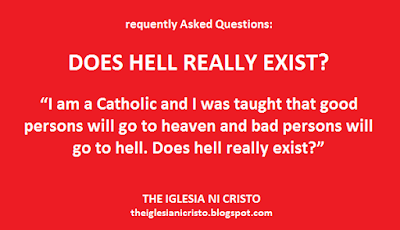 However, hell (the Lake of fire) doesn’t exist yet. According to the Bible, the "rest of the dead" will come to life after the "thousand years," and after that the "lake of fire" will come into being - "fire came down from heaven and devoured them. And the devil, who deceived them, was thrown into lake if burning sulfur, where the beast and the false prophet had been thrown. They will be tormented day and night for ever and ever." One thousand years after the Second Coming of the Lord Jesus and the First Resurrection, the “rest of the dead” will come to life, but to be “thrown into the lake of burning sulfur" (see Rev. 14:9-11). They will be tormented day and night for ever and ever. Thus, hell (the Lake of fire) doesn’t exist yet, but one thousand years from the Second Coming of the Lord Jesus it will come into being. What will happen to a person when he dies? Who will be saved from the eternal torment,from the Lake of fire? “Husbands, love your wives just as Christ loved the church and gave his life for it.